Little Boy Green, F.K.A. Baby Green, has given us a lot of food-for-thought (punny?) in his very short, yet highly entertaining two years plus. In fact, his impact on our diet began months before he was born. Our tentative first steps in changing how we ate were guided by our desire to give him a strong start in life and to nourish him as much as we could. Of course, in order to do so in utero we had to nourish mommy, all the more so as she intended to breastfeed him. As we were moving away from a more traditional diet that included - what we thought to be moderate amounts of - animal food sources, we were concerned that we would be foregoing some nutrition that we believed was more difficult to arrive by on a plant-based diet. We decided that adding dietary supplements was necessary in order to receive all of the nutrition that we needed. Our diet continues to be whole-food and plant-based and we cook and prepare most of what we eat. So it is a rare occasion that we may eat a fortified ready made food such as most breakfast cereals, milks (non-dairy) and fruit juices. The one exception that we commonly consume is B12 fortified nutritional yeast. Because Mrs Green was pregnant, she was already taking folic acid and a very small amount of iron, but we decided to take additional supplements as we were still in a transitional phase. This period in our lives also included my endeavours at becoming more athletic and believing that I too required more nutrition than was available in the food that I was eating, something that I have moved away from completely and relay in the Lessons From Ultra post. Even as we began to rely less and less on supplements, we continued to give a cover-all-bases children's multi-vitamin to our growing boy. There is little more powerful than the fear of restricting one’s own child’s development. Lesson we learned: Little Boy Green, more often than not, knows his needs best (well, food-wise, we don’t ask him about bedtime). After he began to clearly reject the supplement and we ran out of ways to disguise it, we decided that he no longer needed it (if he ever did). We continue to take supplements, not out of fear, but in order to optimise our health. We do so by following how we feel. We are much more in tune with our bodies now than we ever have been, and find that in supplementing our diets based on the needs our bodies communicate to us we have learned one of many great lessons taught to us by Little Boy Green. There are a few supplements that we take regularly as a family, and those we do are generally whole foods based, rather than synthetic. The couple of exceptions I discuss below. We all take an omega 3 algae based oil, vitamin D and vitamin B12. Mrs Green and I also take a whole-food chlorella and spirulina supplement, not because we feel the need to, but because we feel better taking it. We have also found that adding more and more raw foods to our diet is a great way to further reduce our concerns regarding supplementation, but more on that another time. The transitional multivitamin supplements we took came in the form of a daily nutritional shake, and we generally used one by the brand Vega. 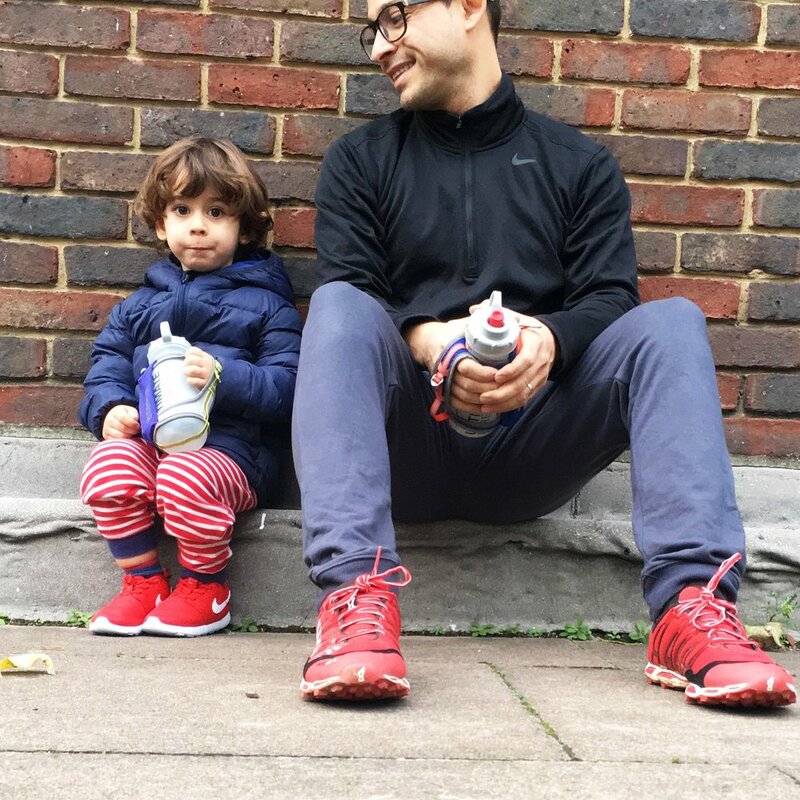 We still consume the shake, but only rarely, for example, if we are travelling or are so busy (working and/or looking after the kids) that we are not able to have very much to eat, or otherwise fall short nutrition-wise in the course of a day. We are keen to see how our food journey will further evolve now that Baby Green has entered our lives. Meanwhile, Little Boy Green is growing and teaching us that the best way for us to look after ourselves is to continue to take care of him and his brother. B12 is a bacteria that lives in soil and is fundamental to good health. Animals have it because they are able to eat directly off of the land and to drink water that has not been sanitised. Humans generally eat washed fruit and vegetables and drink squeaky clean water, both of which are extremely important in the reduction of some very scary diseases. Humans can obtain B12 by eating animals, and there is no plant-based source for it. However, it is not guaranteed that the animals consumed necessarily eat foods with traces of the bacteria. In any event, we prefer the synthetic version. Vitamin D like all vitamins is crucial for human development. Recent studies in the importance of telomeres and longevity reveal that it is a potent anti-ageing vitamin. The best way to access vitamin D is to spend some time in the sun. But, like most things in life, it ain’t that simple. The sun provides two types of UV rays, UV-B and UV-A. While exposure to the first is the best source of vitamin D, exposure to the second is a great way to increase the risk of skin cancer. Also, not every geographic location provides enough sun to supply the dosage needed for optimal health. Natural sources of vitamin D are found in smaller fish, such as sardines, but it is difficult to know the dosage, and, again, we prefer the synthetic version in combination with trying to have moderate exposure to not-too-intense sun. Omega 3 is an essential fatty acid that is is deficient in a typical western diet. Most of the omega fatty acids that we consume are in the form of omegas 6 and 9 because of an overconsumption of processed foods. This is imbalance that can lead to a host of health problems. Omega 6 is prominent in nuts and seeds and overly consumed in their oils. Omega 9 is found in sources such as olive oil. While omega 3 is a plant based source or the fatty acid, humans typically get it from eating animals that consume it. Fish eat algae, birds eat insects and greens, and our mammal cousins eat grass. While these animals do so in their natural habitat, most of the commercially available byproducts of these creatures are given an omega 3 supplementation. Great sources of one form of omega 3, ALA, is readily available in seeds such as hemp, chia and flax, unfortunately the other two strands, EPA and DHA are not readily available in plant form other than in marine algae (one reason why fish oils are so popular) which is why we regularly take a marine algae EPA and DHA supplement.